Hydrogen production via water electrolysis at elevated temperatures is considered the most efficient and low-cost option for hydrogen generation because of its favorable thermodynamics and kinetics. Both the kinetics of water electrolysis on electrodes and the ionic transport in electrolytes can be rate-limiting steps and advanced materials are required to improve overall system efficiency at high hydrogen production rates. A combinatorial approach is employed to evaluate/develop advanced electrode materials, ranging from single perovskites to double and triple layered perovskites, and to modify the surface of existing electrodes with more active nano-structured catalysts. Super protonic conductors are developed that have superior protonic conductivities at relatively low temperatures. The lower operating temperature allows better integration with renewable or waste heat for producing hydrogen economically at large-scale and mitigates the high degradation rate and limited lifespan issues. INL capability experts in this area have a long history in developing electrode and electrolyte materials for various fuel cells using both conventional and high-throughput methodologies. Recently, an electrochemical clean energy laboratory was established through strategic Laboratory Directed Research and Development funds. This newly established lab is capable to design and fabricate a wide variety of advanced materials for oxygen reduction, hydrogen oxidation, water oxidation, and hydrogen evolution, among others. INL also has a Microscopy and Characterization Suite (MaCS) located at the adjacent Center for Advanced Energy Studies. MaCS is a state-of-the-art materials and microstructure characterization laboratory that provides cross-cutting capabilities such as the unique Local Electrode Atom Probe and other surface and tomographic analytical tools. Existing capability ranges from materials discovery, synthesis, characterization, and scale-up to cell fabrication, microstructure modification, high-throughput testing, and electrochemical characterization. INL has recruited two industrial experts with broad knowledge in developing advanced materials for fuel cells, including high-throughput combinatorial materials discovery, scale-up, cell and stack roll-to-roll manufacturing. The INL electrochemical clean energy laboratory has capabilities in materials synthesis, cell fabrication, and high-throughput testing and characterization capabilities (up to 8 channels which are expandable). Other capabilities to be established include high-throughput combinatorial fabrication tools, materials scale-up, cell and stack roll-to-roll manufacturing. Water electrolysis cells operated at elevated temperatures (200°-600°C) can overcome the kinetic challenges of low temperature electrolysis and the degradation challenge of high temperature electrolysis. Advanced materials are essential in improving the overall system efficiency at high hydrogen production rates, reducing capital cost, and efficiently using renewable and industrial waste heats. 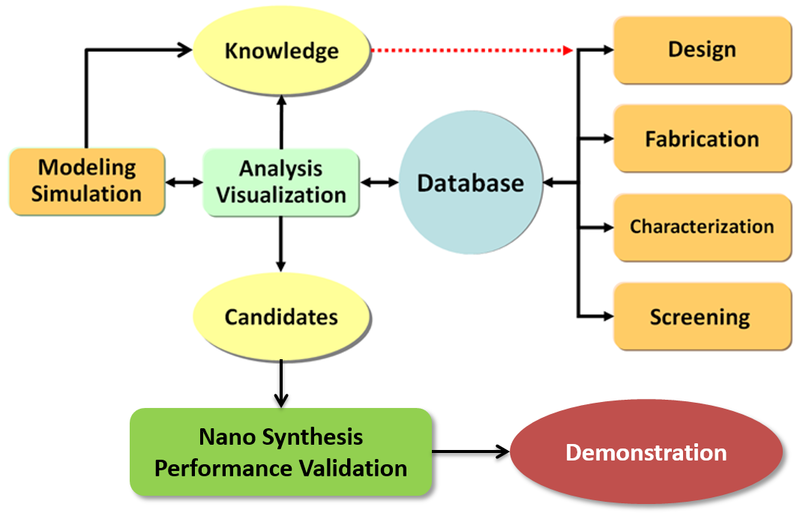 A combinatorial workflow for the discovery of advanced electrode materials. High throughput physical vapor deposition system for material combinatorial studies. T. He, E.R. Kreidler and T. Nomura, US 8,944,002 (2015). Efficient Electro-Catalysts for Enhancing Surface Activity and Stability of SOFC Cathodes. D. Ding, M. Liu, Z. Liu, X. Li, K. Blinn, X. Zhu, M. Liu, Advanced Energy Materials 3, 1149 (2013). Enhancing SOFC cathode performance by surface modification through infiltration. D. Ding, X. Li, S.Y. Lai, K. Gerdes, M. Liu, Energy Environ Sci 7, 552 (2014). Extraordinarily high proton conductivity in water-containing barium yttrium stannate. T. He, K.D. Kreuer, J. Maier, P. Murugaraj and T. Schober, Max-Planck-Institute for Solid State Research 1997 (MPI-Stuttgart, Germany), I-91 (1997). Optimization of BZCYYb synthesis. M. Liu, M. Liu, T. He and L. Yang, US 8,993,200 (2015). Composite solid oxide fuel cell electrolyte. M. Liu, M. Liu and T. He, U.S. Patent Application US13596787 (2013).